Every so often we ask albertapatients about topics that haven’t necessarily been raised in the community, but that have implications for health care and are very big in the public eye. In our last survey, we brought you the topics of opioid prescribing and the use of medical marijuana. More than 2,100 of you kindly participated and thank you so much for your continued support. The results were very interesting and you’ll find them below. We plan to share these with the Board of the Alberta Medical Association and physician specialty groups who do a lot of prescribing for chronic pain. We’ll also send the information to Alberta Health, Alberta Health Services, the College of Physicians & Surgeons of Alberta and the Health Quality Council of Alberta, who all have different roles in the system and share an interest in patient well being. We also anticipate doing a news release on the results because we think you have provided a fresh perspective for the public in the daily supply of news coverage on these opioids and medical marijuana. albertapatients.ca is now one of the largest research panels of its kind in the country and becoming better known all the time. It’s because of you, the members, who sign up and stay and contribute. We’ll be back to you soon with some interesting survey work to help the AMA Board of Directors in its health reform work this year. I wish all of you a wonderful summer season. 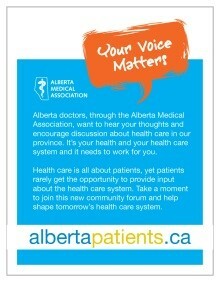 Have fun, be safe and keep tuning in to albertapatients.ca. Thank you, again. In May, we asked albertapatients members about their experiences with opioids and marijuana for pain management. Please read on to the Did You Know section (below) for highlights from that research and a link to the full report. Experiences with opioids and marijuana for pain management. Did you know? Not all patients who speak with a doctor about using an opioid drug for pain management end up receiving a prescription. 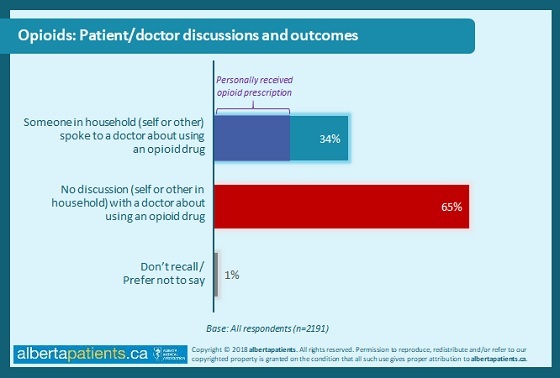 One third (34%) of patients report that they or or another member of their household have spoken to a physician within the past year about using an opioid to manage pain. Of that group, just over half (56%) personally received an opioid prescription. A similar proportion of patients are having conversations with doctors about medical marijuana, and not all of the conversations result in prescriptions. Over one-third (35%) of patients report that they or another member of their household have spoken to a physician about medical marijuana within the past year, and 45% of those patients personally received a medical marijuana prescription. Patients receiving opioid and marijuana prescriptions have some key demographic details in common. 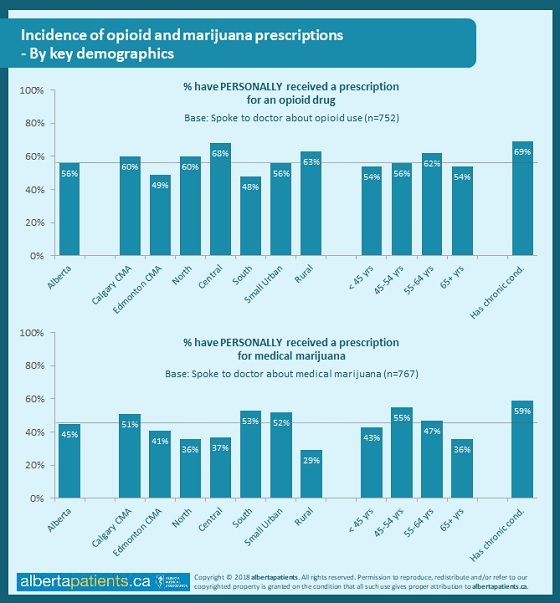 Looking at combined demographics, requests and prescriptions for both opioids and medical marijuana are higher among middle aged Albertans and patients living with chronic conditions.